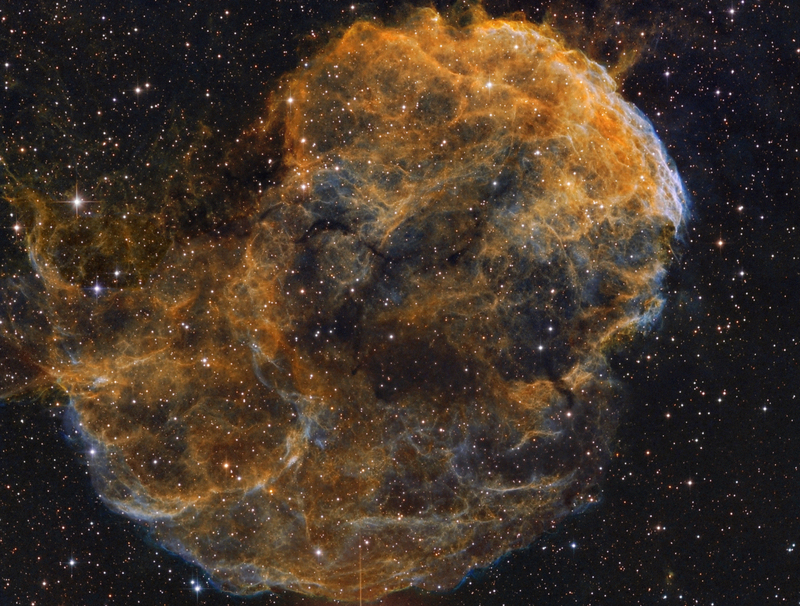 IC 443, also called Jellyfish Nebula, is located at a distance of approx. 5000 light years in the constellation of twins. The nebula is a supernova remnant of a massive star that exploded. The light of the explosion reached planet Earth for the first time more than 30,000 years ago. Like the supernova remnant Crab Nebula, its cousin in astrophysical waters, IC 443 contains a neutron star. At this distance, this image shows a section of about 80 light years. The special feature of IC443 is that the rest of the explosion cloud also interacts with the interstellar medium (gas and dust). New stars have already been observed, the formation of which was accelerated by the supernova and the resulting compression of the surrounding gas.